In the basement of his boxing gym in 1978 San Francisco, owner Reginald Forrest is murdered in his office. The following day, policemen visit the house of Lucy Takeda, a middle-aged Japanese-American woman who matches the description of a woman seen leaving Reg's gym around the time of his death. Witnesses say a woman with a scarred face was present at the crime scene, which is why it's hard to deny that Lucy was involved, given her face matches the witness's description to a tee. Upon hearing the news that her mother Lucy is a murder suspect, Patty Takeda is instantly confused, given she's never before heard the name Reg Forrest in her entire life. After Patty does a bit of minor sleuthing into Reg Forrest's background to learn how her mother could possibly be connected to the man's death, she discovers a box of old photos that reveal her grandmother and Lucy's mother Miyako sitting on the lap of an American soldier at Manzanar, a Japanese-American internment camp located just miles away in the eastern part of central California. Patty also sees photos of her beautiful mother in the days before she was permanently scarred and disfigured, which intrigues her even more about her mother's mysterious background. Lucy's story unfolds as Littlefield takes us back to 1941 Los Angeles, shortly after the bombing of Pearl Harbor. Lucy and Miyako arrive at Manzanar feeling lonely, confused, and desperate. Miyako, who suffers from the then-unknown bipolar disorder, uses her beauty in an effort to secure a promising future for both her and daughter. However, Miyako's beauty only causes problems for her and Lucy with the bullying and barbaric American soldiers who oversee Manzanar. Eventually, Miyako is forced to make the ultimate sacrifice in an effort to keep her daughter safe from the soldiers at camp. Little by little, we learn about how certain horrifying, unspeakable acts can be committed out of a combination of love and desperation with the hope of achieving the greatest possible outcome in a terrible situation. Garden of Stones is a true page-turner; it's hard not to be enchanted by Lucy and Miyako as they struggle through trying to make the most out of their life at Manzanar. Lucy's story is intriguing and painful at the same time, knowing that at some point in the story, you'll learn about how Lucy receives her unsightly scars. On the other hand, learning about what Miyako does behind the scenes for the sake of keeping her daughter safe is also sad and powerful. If you're at all sensitive to violence associated with WWII, you better keep a box of tissues nearby; you're going to need them. There's no way you'll ever begin to guess how the novel ends. Littlefield has a true knack for great storytelling. You'll be hooked from page one, and will have a difficult time not being distracted from your daily responsibilities as you look forward to spending more time with this book. Getting back to Garden of the Stones was my favorite part of every day while reading this novel. 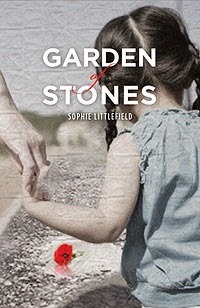 A few weeks later, I'm still thinking about Garden of Stones, which is always a sign you've got great literature on your hands. I'd definitely give it 10 out of 10 stars on a rating system, and I'm already looking forward to reading more of Sophie Littlefield's backlist. (In fact, I just placed an order for House of Glass -- I can't wait!) I can't sing enough praise for Garden of Stones. It definitely goes on my list of recommended reading for anyone who wants to read something amazing.